At Thrale family gatherings you can be sure of one thing, David  is asked to make his popular trifle. I'd like to claim the credit for this great recipe, but I really learnt it from my parents - Ken and Shirley - who made it for their occasional dinner parties. The secret is that it contains no jelly. Makes about 10 portions. It takes at least 12 hours to prepare a trifle because the first stage must be left to set overnight, before the second stage can be started. OK, let's do the cheating bit first! Split the (shop bought) trifles sponges into two. Spread the insides with a very generous helping of blackcurrant jam. Replace the tops to give a jam sandwich effect. Arrange the jam sponges in the bottom of a large decorative glass bowl (don't spoil it by making in an ugly utility dish). Sprinkle the sponges with sherry. Peel two bananas, cut in half and slice lengthwise. Arrange the sliced bananas on top of the trifle sponges. Sprinkle generously with sliced almonds and half the fresh fruit. Make one-and-a-half pint of thick custard, pour onto the sponge and fruit whilst still hot. Leave to stand at room temperature for at two hours. Then place overnight in the 'fridge. Sprinkle some sliced almonds (saving some for the topping) over the custard. Spread the rest of the fresh fruit over the custard, along with two more sliced bananas. I use different fruits according to the season and my mood. I think that that fruits need to be a little tart to balance the sweetness of the other ingredients. So I use berries, strawberries, blackcurrants, loganberries, raspberries, etc. The only tinned fruit I use, are mandarins. Out of season, berries can be bought frozen. Pick the most expensive packet you can find (the cheap ones are too mushy). Pour the double cream into a food processor or mixer. Add three table spoons of sugar. Beat until stiff - don't over mix. Use a palette knife to spread the cream over the trifle. Apply evenly. Smooth the surface as best you can (I use a circular motion). Wipe away surplus from the edge of the dish. Decorate the to of the trifle. I mostly use any fruit leftover, arranging in alternate rings of sliced almonds. Sometime I use a little crumbed chocolate on the top as well. 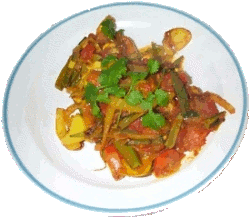 Make 8 to 10 servings with a very easy recipe. Mix the batter ingredients together. Let rest for 10 minutes. Preheat oven to 450°F or 230°C. 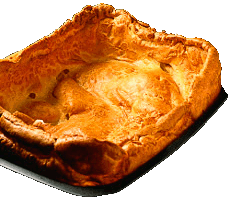 Preheat a Yorkshire pudding tray or muffin tin with ½ inch (1 centimetre) of oil in each section. After the 10 minutes divide the batter into the tray. Cook for around 15 to 20 minutes until crisp and puffy, don't open the oven door before then or they won't rise. A simple vanilla and chocolate marble sponge base with a soft sweet chocolate decoration. Easy to make and kids love it. Line base and sides of the cake tin with greaseproof paper. Place caster sugar and margarine into mixer. Mix until smooth and creamy. Sift the self-raising flour into separate bowl. Break an egg over the sugar and margarine mixture, add two tablespoons of sifted flour and beat in. Repeat until for all three eggs. Add any remaining flour mixture and beat in. Add a little milk if the mixture is too stiff. Sift Cocoa powder into separate bowl. Spoon three-quarters of mixture into lined baking tray. In to the remaining (not in the cake tin) mixture mix in the three heaped tablespoons of Cocoa powder. Spread chocolate mixture onto sponge mixture and mix in with skewer to give a marbled effect. Place in middle of preheated oven (180°C, 350°F, Gas Mark 4) for about 40 minutes. Do not to open oven door until cake has fully risen - unless you want a sunken cake! Test with a warm skewer to see that the cake is cooked in the centre. Leave in the baking tray to cool then turn out. Have the chocolate cake ready. Make the icing by beating the butter with the sieved icing sugar. Dissolve the cocoa in a tablespoon of boiling water and mix until the mixture is stiff. Spread the bottom of the cake (so that the number is the right way around) with butter icing. Spread butter icing all over the sides and lift it on to a plate or cake board. Sprinkle the icing plentifully with 'Hundreds and Thousands' or Smarties. An alternative chocolate decoration is to simply melt a 500 gram bar of milk chocolate in a Pyrex dish by placing it over a saucepan of very hot (not boiling) water. Break the chocolate into small pieces and stir with a wooden spoon until soft. Pour and spread the mixture over the cake and leave to set. If however, you want to decorate the icing do so before the chocolate sets hard. I never used to like cranberry sauce - until one Christmas I saw a recipe on TV and thought it was easy enough to try for visiting relatives that liked this sort of thing. However, I tried a little bit with my turkey and loved this home-made version. So, if like me you have only tried the awful bottled stuff, and didn't like it, try this instead. Its great! Place all the ingredients in a pan and cook until the berries have burst, which should be after about 10 minutes. 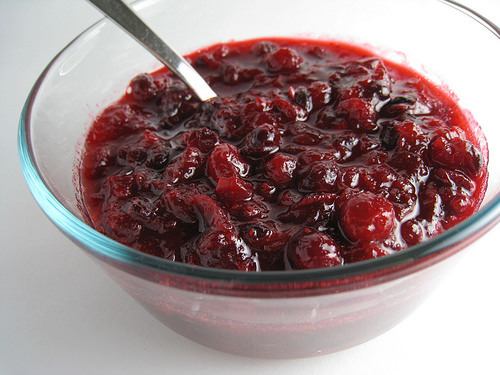 The cranberries pectins, means that the sauce solidifies to a jam-like consistency after it cools. Once the majority of the berries have burst, take the pan off the heat, even though it still has a watery consistency. Taste to test whether the sauce needs more sugar. If it is too sweet, add some lemon juice.